Image courtesy of FamilyFun magazine. Chinese New Year is right around the corner and we thought we’d serve up a dish full of ancient symbolism. This recipe for pork dumplings is a perfect way to start the New Year with a savory fare that’s been enjoyed for thousands of years. Jiaozi or dumplings have been eaten for centuries in China and continue to be a staple in Chinese cuisine. They are enjoyed specifically at Chinese New Year because their shape resembles the ingot, an ancient Chinese currency, and thus represent wealth and prosperity in the coming year. The ancient Chinese ingot was called a sycee and first appeared during the Qin Dynasty (221-206 BCE) and remained in use until the end of the Qing Dynasty (1644-1912 CE). Historically, cooks preparing holiday batches of dumplings would hide a coin inside one dumpling. Whoever bit that coin would be the luckiest and most prosperous in the new year. However, this tradition has largely disappeared due to health hazards. Swapping a coin for other fortuitous symbols, today’s cooks include various ingredients considered to bring good luck, such as peanuts, which symbolize long life. The jiaozi are to be eaten at midnight on Chinese New Year’s Eve during the last hour of the old year and the first hour of the new year. Making the dumplings can be a wonderful group activity for friends and family this special time of year. And when you think about it, what better fortune is there than to have those who mean the most to you share a cherished repast? So this Friday night, gather together with family and friends, cook up some pork dumplings and celebrate a prosperous Year of the Horse! *Recipe is courtesy of spoonful.com. Bring a small pot of water to a boil. Add the cabbage and blanch it for 1 minute. Drain the cabbage, rinse it immediately with cold water, then drain it again. Over a sink or bowl, squeeze small handfuls of the cabbage to release as much water as possible, then wrap it in two layers of paper towels and squeeze again. Wrap and squeeze the cabbage one more time, then set it aside. Whisk together the egg white, soy sauce, oyster sauce, sesame oil, cornstarch, sugar, salt, and pepper in a medium-size bowl. Stir in the cabbage, scallions, ginger, and garlic. Add the pork and stir the filling until it’s thoroughly combined. Fill a small bowl with cool water. Lay 4 dumpling wrappers on a work surface, covering the remaining wrappers with a damp cloth. Spoon 2 level teaspoons of the filling onto the center of each wrapper. Using your fingertip, moisten half of the outer edge of the wrappers with water. Pick up each wrapper and bring the opposite edges together over the filling, forming a taco shape. Press the edges together, pinch a few pleats to seal the dumpling, then gently squeeze around the filling to eliminate any air pockets. Transfer the stuffed dumplings to a baking sheet lined with parchment or waxed paper, spacing them so they don’t touch. Keep them covered with a damp cloth while stuffing the remaining dumplings. In a Dutch oven or other large, lidded pan, place a lightly oiled metal steamer, or lettuce leaf–lined bamboo steamer, over an inch of water (make sure the water doesn’t touch the bottom of the steamer). Bring the water to a gentle boil. Arrange half the dumplings on the steamer, spacing them so that they don’t touch. Cover the pan or bamboo steamer tightly. Cook vegetable and shrimp dumplings for 5 minutes and pork dumplings for about 8 minutes. Transfer them to a plate and serve immediately, or keep them covered in a warm oven until the remaining dumplings are cooked. Heat 1-1/2 teaspoons peanut (or vegetable) oil in a large nonstick skillet over medium-high heat. Arrange half the dumplings in the skillet and cook, without disturbing, until their sides are golden, about 2 minutes. Add 1/4 cup water and immediately cover the pan, reducing the heat slightly. 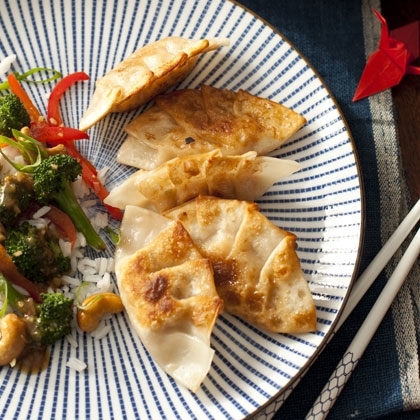 Cook shrimp and vegetable dumplings for 3 minutes, pork for 5 minutes. Uncover the pan and raise the heat again. Cook off any remaining water, shaking the pan a few times, and continue frying the dumplings until their sides become crispy, about 2 minutes more. This entry was posted in Blog, Bon Appetit Wednesday, Culinary, Culture, Holidays, Public Life and tagged ancient food, ancient history, AntiquityNOW, Bon Appetit Wednesday, Chinese New Year, jiaozi, pork dumplings, Qin Dynasty, Qing Dynasty, sycee, Year of the Horse. Bookmark the permalink.